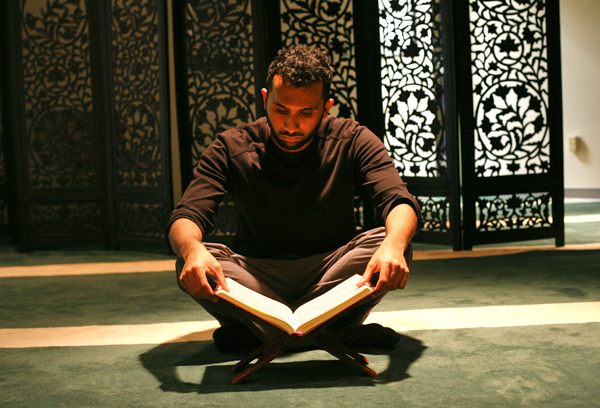 Muslim Student Association president Aabid Mohiuddin reads the Quran in a Marvin Center prayer room. The organization hired its first chaplain in 10 years this fall to lead services and as counsel students. For the first time in a decade, members of the Muslim Students’ Association heard a service led by their own chaplain as they bowed their heads to prayer rugs. Until this fall, GW’s only Muslim organization couldn’t afford to pay a religious leader for weekly services or to counsel members using just their student fees. Then economics Ph.D. student Meraj Allahrakha, a devout Muslim, stepped forward to fill the role. He will hold a bi-weekly Quran reflection and lead services on the first Friday of each month, as well as meeting with students personally for religious and social counseling. While earning his master’s at GW, Allahrakha said he often wished he could find spiritual support from a Muslim chaplain the same way students in GW Hillel or the Newman Center had religious leaders to lean on. “The thing we lacked was someone who was knowledgeable and engaging enough to be our ‘go-to’ person with religious questions, dilemmas and spiritual advice,” said Allahrakha, who also teaches a financial economics class for undergraduates. Bringing on a chaplain will help create “the right atmosphere” for students seeking spiritual fulfillment, said Aabid Mohiuddin, the president of the Muslim Students’ Association. He said it would also help motivate students to be more active in the community. About 2.6 percent of GW students are Muslim, according to a 2008 national study conducted by University of California at Los Angeles researchers in which 1,000 GW students were surveyed. “It’s great to have someone who our members can rally around,” Mohiuddin said. Allahrakha has also taken on the responsibility of working with the Multicultural Student Services Center to plan interfaith events. But Mohiuddin said he is worried what will happen when Allahrakha earns his doctorate in the next year or so. He said the group doesn’t have the funds to pay someone full-time. The Muslim Students’ Association receives about $3,000 annually, putting its budget in the top 50 among student groups across GW. Still, Mohiuddin and Allahrakha say that’s not enough to fund programs and services for up to 300 members. And out of the more than a dozen other religious groups at GW, they say a few thousand dollars each year is not enough to provide spiritual support for all members. “Student-run organizations are great, but if the organizations themselves feel that they are not well-equipped enough to offer the type of spiritual support that students on campus need, then I think this should be addressed and a solution developed,” Allahrakha said. Dignity GW, a Catholic group comprised largely of gay students, has also struggled to hire a permanent religious leader. Damian Legacy, the group’s co-founder who graduated last year, said members struggled personally after a string of volunteer priests called it quits during the first few years, largely because of a lack of funding. Dignity GW received about $300 out of the Student Association’s $1 million pool of fees. There are only a few small or mid-size religious groups on campus, he said, likely because of a lack of funding. Larger religious groups, like the Jewish Student Association and the GW Catholics, were awarded $22,500 and $10,000 last year, respectively. The groups’ related national organizations – Hillel and the Newman Center, respectively – have outposts on college campuses nationwide, and have larger fundraising bases that help bring in donations. Because the SA cannot completely fund the nearly 500 groups on campus, Legacy said the burden partially falls on GW. He said the University should support spiritual and religious growth to the same capacity as it does academic programming. Unlike many other universities similar to GW, like New York University, GW does not have an Office of Religious Life. It’s been a work in progress for the past year, said Terri Harris Reed, vice provost for diversity and inclusion. In the meantime, Associate Director for Inclusion Initiatives Timothy Kane works with students on religious efforts, Reed said. In that role, Reed said Kane serves as a resource to “students as they reflect upon the role of faith and spirituality as it may relate to issues of diversity and social justice.” Much of the programming, Reed said, centers on how students look at issues such as relationships, work and peace through a religious lens. “We are committed to fostering a campus that is welcoming and takes seriously the religious life of our students, and in the coming months and years will continuously assess where improvements can be made,” Reed said on behalf of Kane, who declined to comment.